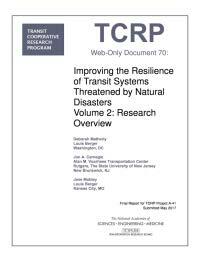 Resilience adoption and climate adaptation planning and implementation by United States transportation agencies is relatively new — less than 10 years old. Most reference documents on these topics have a heavy focus on threats, hazards and potential impacts from extreme weather and climate impacts. In that regard, there are basically two streams of literature. One stream focuses on understanding system vulnerabilities and documenting the impacts of recent disasters on transportation assets. The other highlights leading practices and what can be gained from adopting resilience measures and approaches in a pre-disaster context. This report includes a literature review synthesis and thematic overview of current practices as well as a summary of major themes and examples of effective practices from case studies of various transportation agencies throughout the country, in Sweden and London. Click here to download a copy of Volume 2: Research Overview.